When I tell people we homeschool, people sometimes ask about how I plan to do science as the children get older. For some reason it’s the one subject they can’t imagine happening at home. 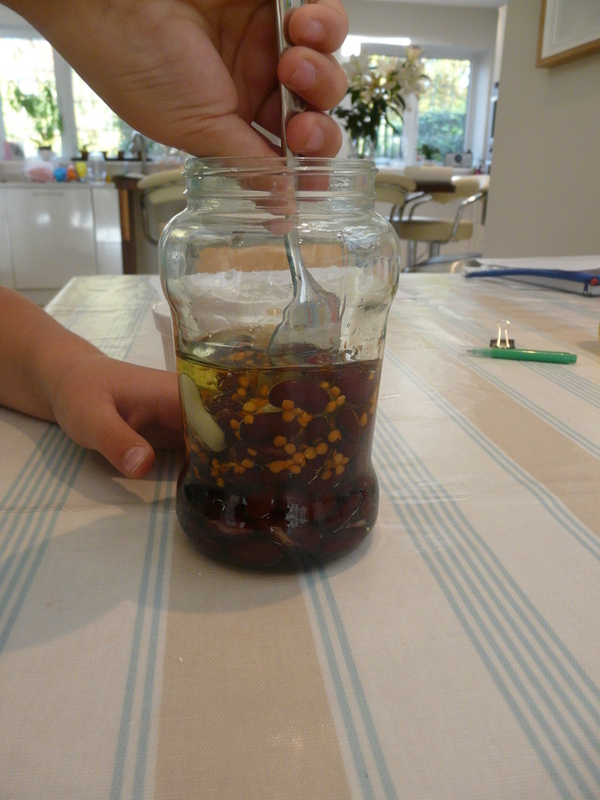 Well, my experience so far is there is a wealth of resources out there – books of fun experiments, great websites, inspiring blog memes like Science Sunday, plus of course the usual wonderful selection of homeschool blog posts. In fact science is possibly the easiest subject to find ideas for. 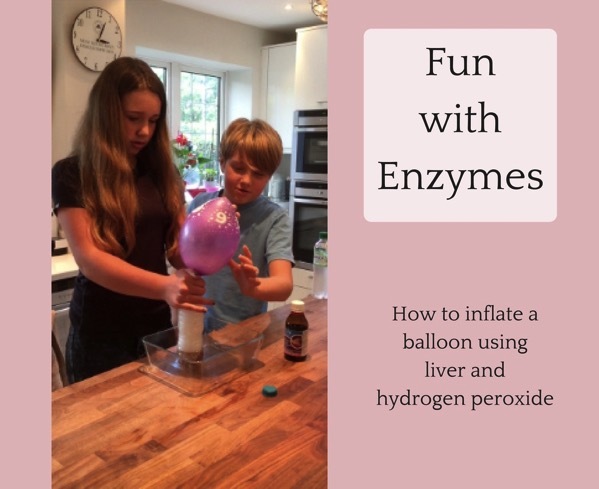 All these, together with a few living books and the children’s innate curiosity, would almost certainly be enough to give primary aged children a great start in science. Not the most interesting photo ever. But the tablecloth is nice. 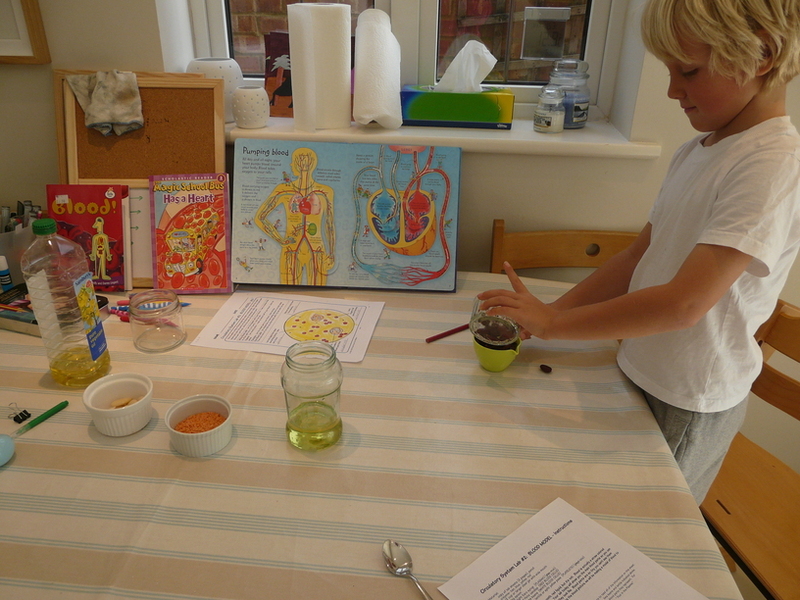 Then when I read Weird, Unsocialized Homeschoolers’ review of the REAL Science Odyssey curriculum, it sounded brilliantly hands-on, plus it ticked the box of being available as a (UK-friendly) downloadable eBook, so I thought we’d give it a go. 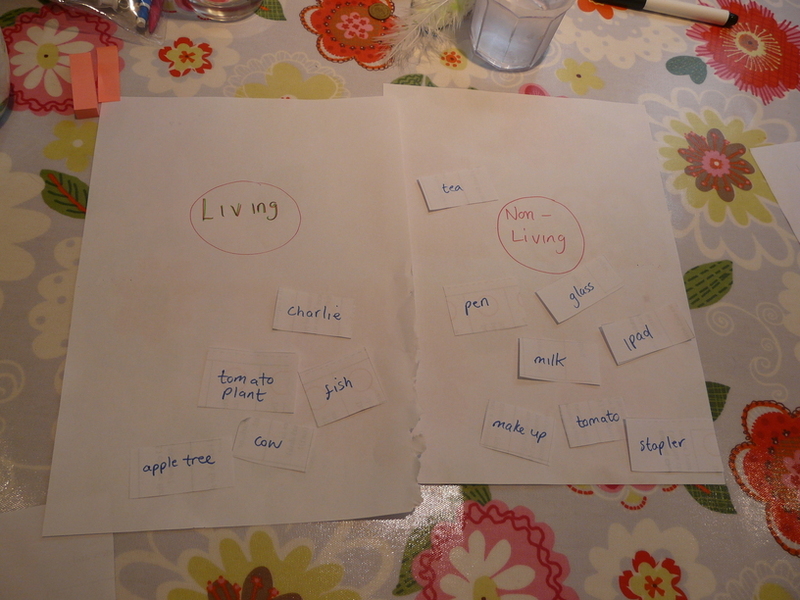 We began the “Life” curriculum (C’s choice) before the summer break so we started this year’s science with a recap of the differences between living and non-living things. In keeping with his new love of writing (really!) J eagerly seized and completed the chart I had half filled out back then on his behalf (him dictating what to write). His answers to whether a rock or a bicycle moved on their own, breathed, reproduced etc were rather random but very interesting and the exercise definitely got him thinking! 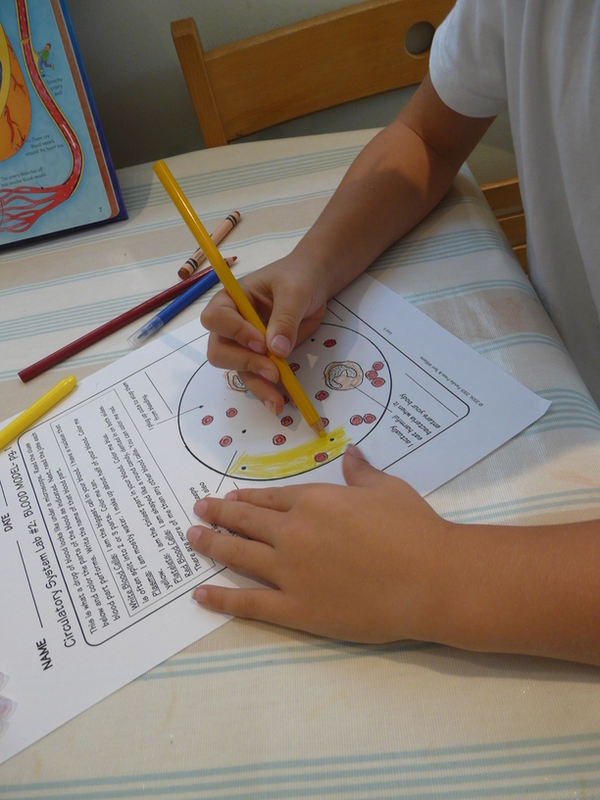 Next we talked about how living things are made up of tiny cells, and looked at an egg as a rare example of a cell that’s big enough to see with our eyes. Luckily I had half a dozen slightly-out-of-date eggs to hand because it took the children a few goes to crack their eggs without breaking the yolk! Before we cracked the eggs we looked at them through magnifying glasses and noted the tiny holes in the shell through which air and water pass. 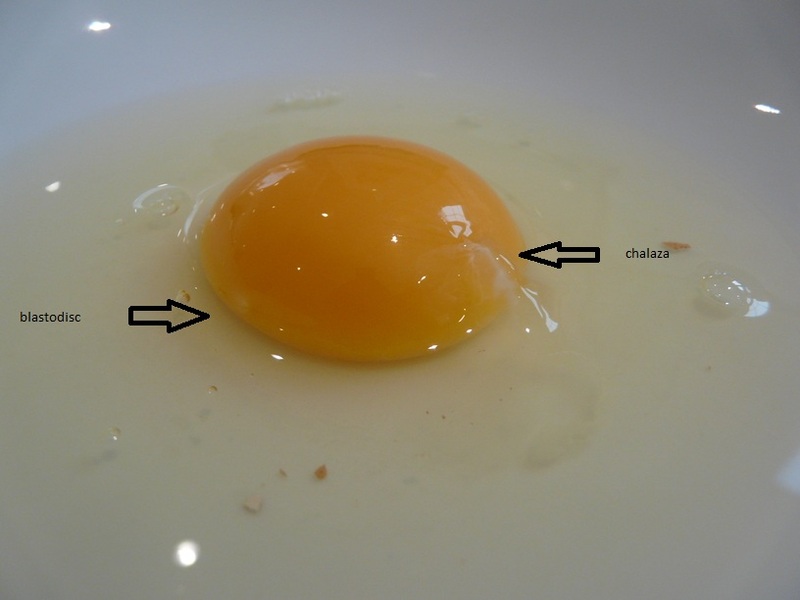 Then we talked about the parts of the egg and their purpose, and found the tiny white blastodisc in the yolk and the tail-like chalaza which anchors the cell, neither of which I have ever noticed before! 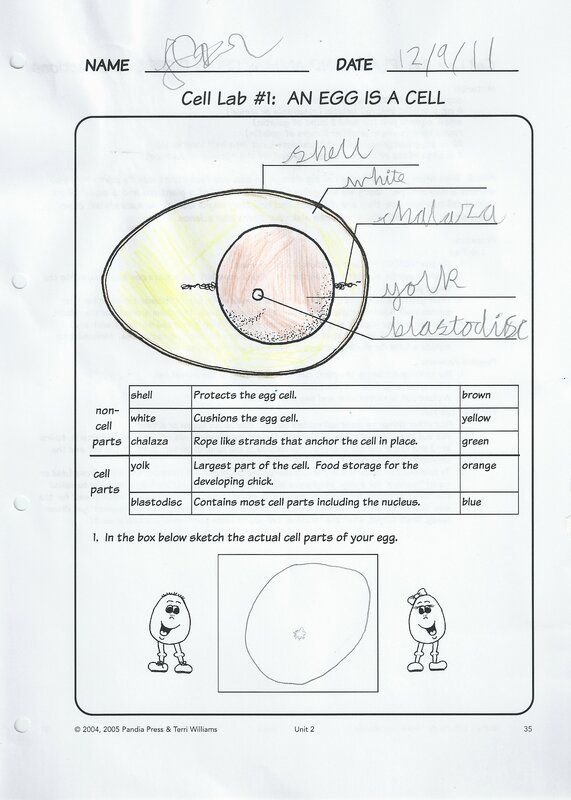 We’d lost J to lego by the time it came to drawing the egg, but C enjoyed colouring and labelling hers, and I left J’s page blank – who knows when he might decide to come back to it with a wave of enthusiasm! I don’t know how science will evolve for us if we’re still homeschooling at senior school level – I’ve heard of people getting together in science co-ops and even using school lab facilities – but thinking back on my own school science experience, I don’t have the slightest doubt that if C and/or J are still at home, the freedom they will have to pursue their own interests at their own pace and on their own terms will definitely outweigh any shortcomings in facilities. Besides, there’s not much you can’t get on the internet these days!